To coincide with the closing of Franz Gertsch: Polyfocal Allover, Eva Kenny will give a lecture on Gertsch’s technologies of reproduction and their relationship to the subject matter of his paintings, as he turned from the “situation portraits” of the late 1960s and 1970s to the iconographic portraits and woodcuts of the 1980s and 1990s. 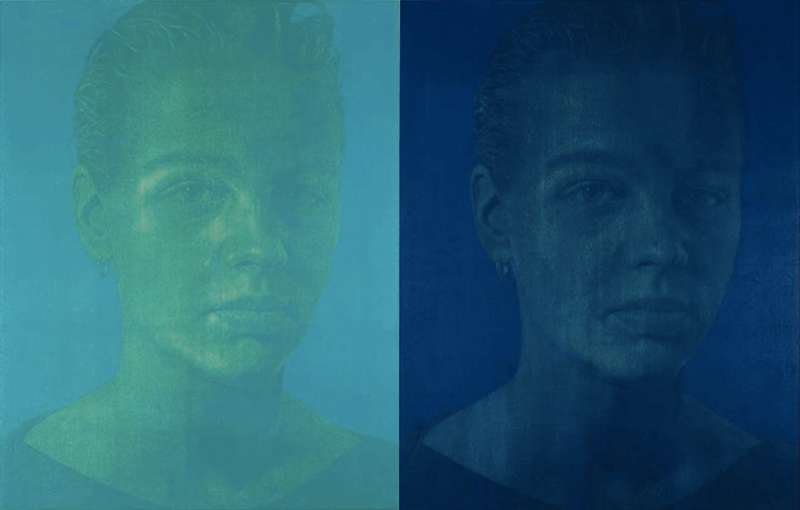 Kenny has written about Gertsch’s female portraits and the ideologies behind Tiqqun’s Preliminary Materials for a Theory of the Young-Girl (1999/2012) in a 2015 issue of Flash Art devoted to photorealist painting. Eva Kenny is a writer based in Dublin. She has just finished her doctoral dissertation on Samuel Beckett’s legacy among American artists of the 1960s and 1970s, and has published widely on art and culture of the postwar period in the US and Europe. Her writing can be seen in Flash Art, Kaleidoscope, Brand New Life and Art Papers as well as independent publications and exhibition catalogues. Images: Franz Gertsch, Natascha I, 1988, Woodcut Print, 108 1/2 x 85 1/2 inches (276 x 217 cm), left. Natascha IV, 1988, Woodcut Print, 108 1/2 x 85 1/2 inches (276 x 217 cm), right.